The wetsuit-clad women clambered over the rocks and up onto the concrete pier, dropping their nets heavy with conch and abalone while officials, family and photographers crowded around them. Sanbangsan loomed above them in the bright blue sky, a picture perfect backdrop. 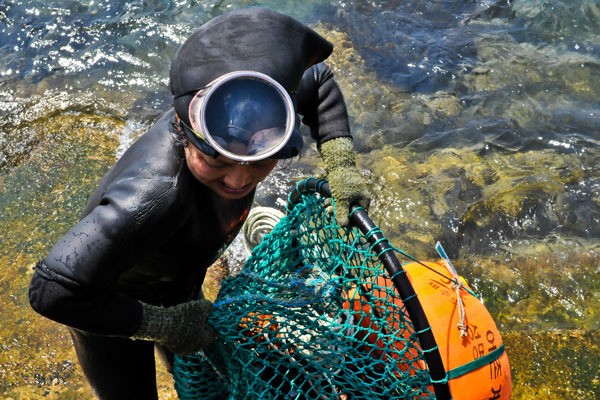 Normally, Jeju’s famed women divers, the haenyeo, do their seafood harvesting without such an entourage, but today was the annual Haenyeo Diving Competition, and it drew a crowd of the curious to Sagye-ri harbor to watch these women at work. After the divers dropped off their nets, they headed to a nearby building, and emerged moments later still wearing their wet suit hoods, but now with perfect makeup right down to red lipstick and delicate gold earrings. They were ready for their closeup. Their smooth skin belied their age, which could have been anywhere from 30 to 80. More than half the haenyeo on Jeju are over age 50. Two of them posed for tourist photographs, but not enthusiastically. ”Bali bali,” one said, looking toward the end of the pier, where their catch was being weighed. Hurry hurry. These women still had work to do. The haenyeo have become one of Jeju’s top tourist attractions and a valued cultural asset. They are a unique entity. Of all the coastal communities in the world, only Jeju has the haenyeo. Wearing only wetsuits and face masks, equipped with a net and rudimentary seafood gathering equipment, the women hold their breath and dive for up to two minutes in search of underwater prey. The best divers are said to dive as deep as 20 meters in the waters off Jeju and its surrounding island. A flat tool is used to pry abalone off of rocks, a hook snares octopi from their rocky underwater lairs, a sharp knife cuts seaweed. Everything, it seems, is up for grabs under the sea. Indeed, the culture of the haenyeo was one born of necessity. For hundreds of years male divers plied the deeper waters, while women worked the shallows near shore. But male divers had to pay heavy taxes, while women did not. The number of male divers dwindled and the women gained prominence until by the end of the Josun Dynasty in the early 20th century, the sea was their kingdom. These women became the main breadwinners in the household, and Jeju society developed a matriarchal leaning that was at odds with the Confucian culture that reigned in mainland Korea. Jeju women are still said to be more independent-minded than their mainland counterparts. During the Japanese Occupation the feisty haenyeo are credited with staging an uprising against their oppressors, fighting to protect their livelihood and the sale of their sea harvests. Today the modern Haenyeo Museum marks the spot of the 1932 rebellion, at Gujwa Village on the north coast. While haenyeo could once be seen in every inlet around Jeju, today there are only about 5,500 divers, and as their ages climb, their numbers dwindle. Diving for a living is not tops on most young Jeju women’s career choices list, and most Haenyeo are now in their 50s and up. It’s a dangerous profession and one that takes its toll. Dying of a heart attack while diving is a constant fear, and many haenyeo suffer from headaches, arthritis and joint problems for the prolonged exposure to the cold water and diving without oxygen. While most of the women dive only two weeks out of a month, and work on farms the other days, they earn a good income from the sea, perhaps as much as the equivalent of $2,500 a month. With these earnings they have bought a better life for their families, but increasingly, that life does not include following in mom’s flippers. The 60-plus divers who gathered at Sagye-ri recently did not seem like part of a dying breed. They were vibrant, full of life and obviously keen competitors.